Well that's the schools finished for the summer which means it's time to launch this year's Summer Reading Challenge! 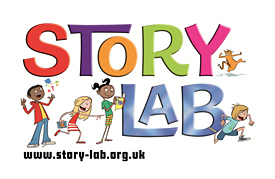 Children can sign-up for free and receive their own 3D Story Lab model where they can keep track of their progress. Help the Story Lab characters find the three lost items, by collecting stickers for every two books read, you will need to read a total of six books to find all three items and complete the challenge. As well as the stickers to collect you can join in the fun on the Story Lab website, where you can create your own profile; take part in the competition to win a lap-top computer by finishing a story started by top authors Jacqueline Wilson and Andy Stanton; use the Book Sorter to help you decide which book to read next; share book reviews and recommendations with other readers; and meet the Story Lab characters and find out more about their adventures.